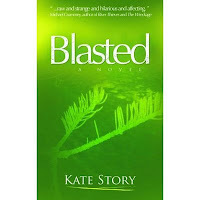 I read about Kate Story’s debut novel, Blasted, over on Indextrious Reader way back when I was a brand-new blogger. I’m kind of a sucker for stories about Faerie, so I put it on my list, and our current science fiction and fantasy focus seemed like the perfect time to get around to it at last! Ruby Jones is from St. Johns, in Newfoundland. And according to the Dictionary of Newfoundland English, a “blast” is “an infection, wound, or physical injury attributed to the malignant activity of fairies.” In this book, Ruby’s family is blasted, generations back, and so is Ruby herself. We meet her first in Toronto, as she scrapes her way through her days in a haze of alcoholic binges, casual sexual encounters, destructive rages, reckless motorcycling, and barely-making-it waitressing. Her friends are piling up achievements (gallery openings, weddings, interesting photography, filmmaking), but Ruby seems stuck in a horrendous apartment and a spiral of drinking that is masking fear and flight. This situation is interrupted by her grandmother’s death. Ruby returns to St John’s for three weeks to help her grandfather with the funeral, and is re-initiated into some of the old questions, and none of the answers. Why did her father become so strange, flat, and withdrawn in winter? Why did her grandparents keep bread on the windowsills? Who were the women she once saw dancing in a circle on the Fairy Rock above her house? When Ruby returns (flees?) back to Toronto, things become worse, not better. She’s haunted by strange characters and birds. She walks at night without realizing it, and every encounter could be a fairy ritual: They have been waiting for her for a long time, and they intend to have her. It is only when she finds the courage to face her past that she can gather the energy to create some kind of future. This book does certain things very well. Story creates a sense of place — both St Johns and Toronto — with expertise, allowing us to feel the dilapidation of the one and the crowded heat of the other. There’s meaning in the places of this book, in the stones and the roads. She is also very good at creating ambiguity, and at letting it sit there with the reader. She never quite explains: at the end, there are multiple explanations for what happened, and Story allows it to be mysterious. I like that in a book. I like to shiver, wondering whether Ruby’s father really spent the winter somewhere far away while a changeling grew fat on his family’s food, or whether he was an alcoholic with seasonal affective disorder. But there were places she missed the boat, too. Ruby, as a character, is too one-note. She’s feisty, for sure: foul-mouthed and introspective. But after a while, that becomes binge-drinking and navel-gazing, with no way out. Her eventual epiphany and self-rescue seems radically unlikely, given the total lack of character development over nearly 300 pages. Why do her friends continue to tolerate her, given that she crashes on their couches for months, accepts large loans she can never repay, uses them sexually, ruins major life events such as weddings, and is constantly hateful-drunk? I got tired of Ruby, and I don’t even know her. In other words, this novel was a really promising beginning from Story. It had a lot going for it, and I’m glad I read it: it was shivery and mysterious and entwined the strands of family trauma and folklore with a deft hand. With a few tweaks, it could have been really great. Look for more from her. Having never heard of this book before today it’s now been brought to my attention twice. Someone must be tying to tell me something. I’d better see if it’s been published this side of the Atlantic.